College is a time of being on your own, learning who you are as a person, and gaining new experiences. Maybe it’s a time of taking chances and becoming the person you’ve always wanted to be. College experiences vary for everyone, and are particularly different for those who join fraternities or sororities. Thanks to the girls in my sorority, I learned even more about myself than I thought I would in college. The girls I met through this process taught me the meaning of sisterhood and what it means to be a part of a different kind of family. Being involved in a sorority can be one of the most life changing parts of college. The girls you meet and bond with, along with all the crazy experiences you get into together are one of a kind, and forever remembered! The history, traditions and long-lasting friendships is what makes me proud to be part of a sorority. Sororities and fraternities are social organizations that have been around for centuries. The first Greek letter organization was Phi Beta Kappa at the College of William and Mary in Williamsburg, VA. in 1776. It was originally formed as a secret society that was literary and social in nature, but not Greek. This society had all of the same components as today’s fraternities and sororities: a motto, rituals, a badge, a bond of friendship, principals of high idealism, and an urge to share the organization’s values through expansion to other campuses (San Jose State University). Fast forward to 1882 – after dozens of more chapters and fraternities fought to be formed and fraternity membership numbers reach nearly five million – to when the first women’s organization, Gamma Phi Beta, was named a “sorority.” Before this, all of the societies were called fraternities because that was the only word that existed for these organizations. Women were part of fraternities, also known as sisterhoods, but quickly noticed that a distinct organization for women was needed, and thus, “sororities” were born and I am so glad that they were! Specifically for sororities, graduation is such a special event. Graduating is both a happy and sad occasion; it is happy because you are excited to move forward with your future, but also a little sad because you have to leave the girls who have been a big part of your life for the last couple years. Each sorority has their own rituals and traditions for graduation, and each one is unique to their chapter. Nonetheless, graduation traditions are something that each sorority celebrates and looks forwards to. Almost all of these ceremonies involve the sisters in the sorority giving each senior a memorable gift. These gifts are typically something nice and an item that they can keep forever – jewelry is a popular present. No matter what sorority, or for what occasion, jewelry will always be a classic gift for any woman. 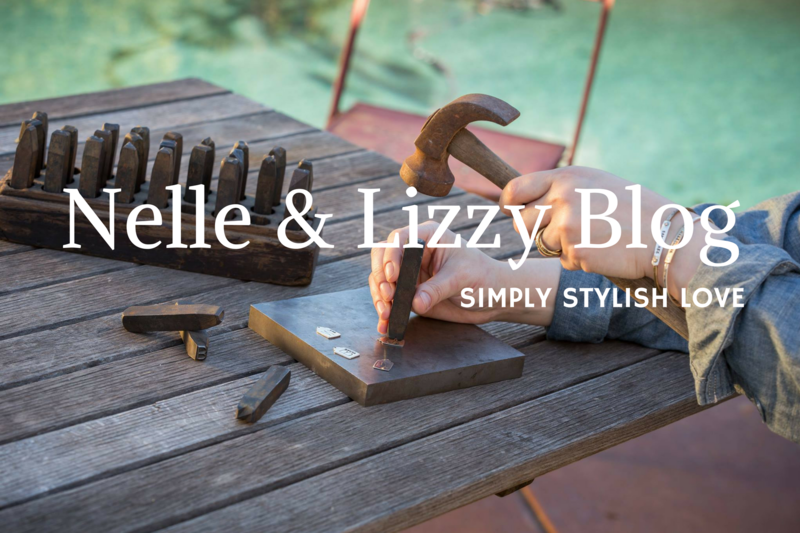 All of the Nelle and Lizzy collegiate jewelry are official licensed Greek products and I’ve picked out a few of my favorite pieces from their Sorority Collection to share with you. Each of these pieces are timeless, beautiful and a wonderful way to showcase your sorority pride – whether a current student, graduating senior, or proud alumni. If you’re interested in shopping more of our Sorority Collection, you can browse the whole collection here. 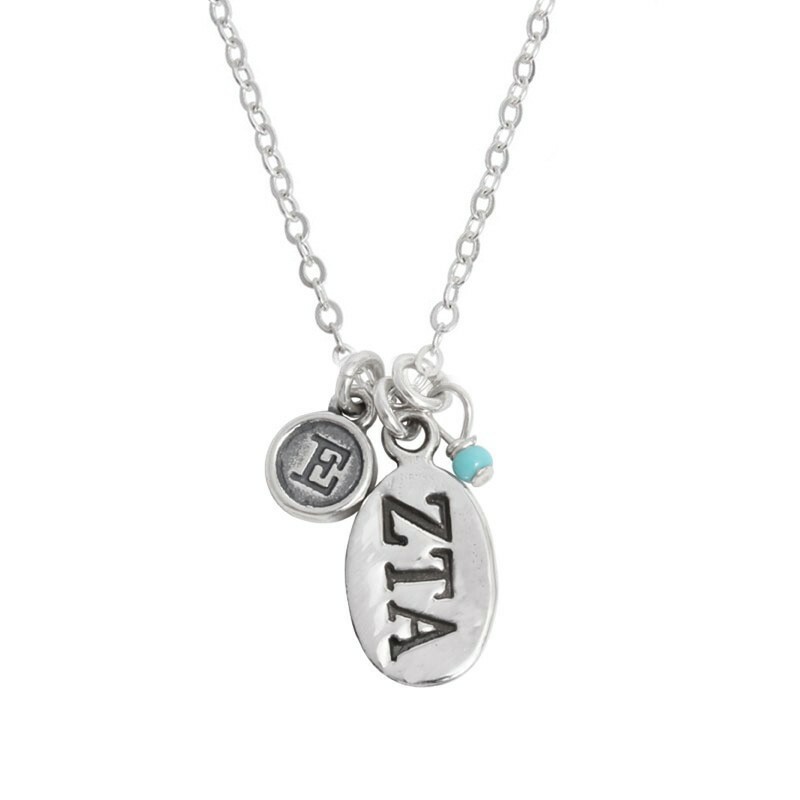 This dainty necklace comes with 3 different charms – an oval stamped with the ZTA Greek letters, a circle charm with the initial of your choosing, and a perfectly wrapped turquoise bead – the perfect addition for ZTA! This sterling silver piece of jewelry is simply designed, but will be the perfect reminder of all the great memories you have tied with Zeta Tau Alpha. This perfect piece of sorority jewelry would be a great gift for graduation, or really any other occasion. You are able to customize this double ring to say exactly what you’d like! As a gift, you could add that person’s name and the Pi Phi Greek letters or your name and your little’s name. This would even be a perfect gift for yourself, as the customizable options are endless! 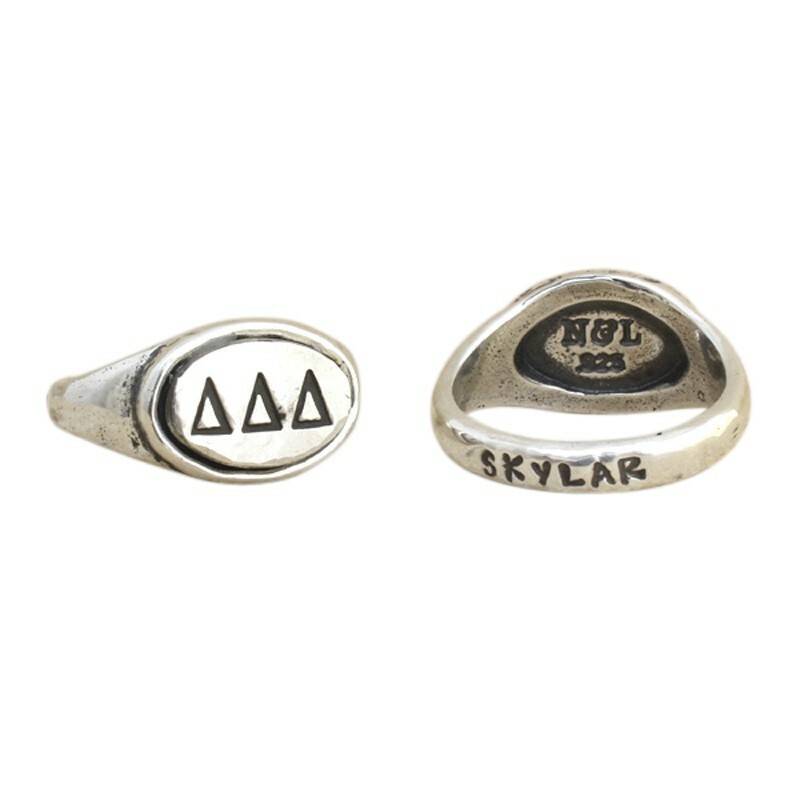 This Tri Delta Sorority ring is another perfect gift. It has a similar style to college rings and all the silver in this ring is sterling silver. 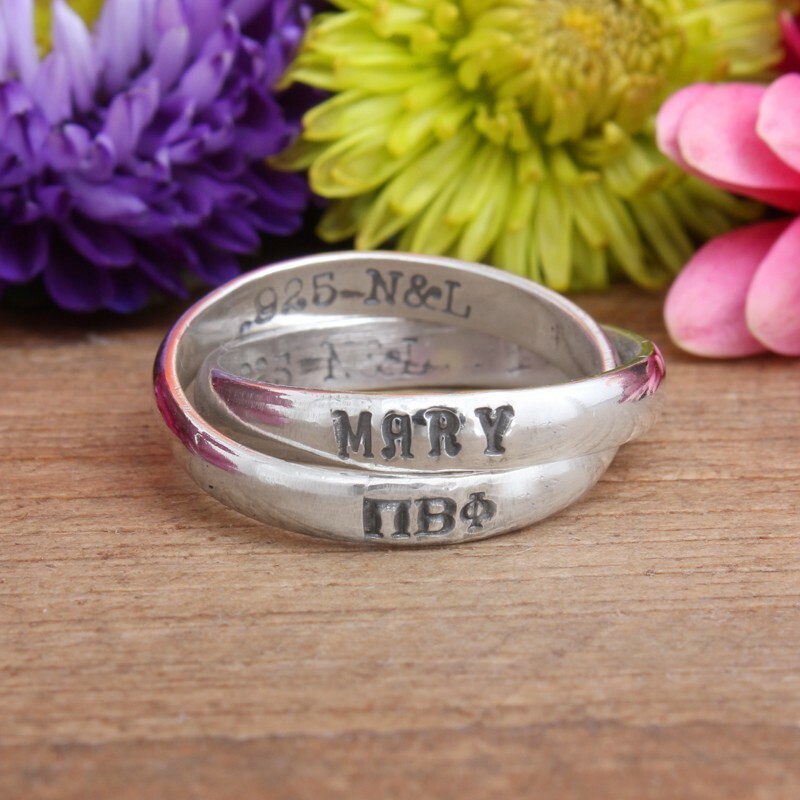 The stamped plate (where the Greek letters show) is available in silver and gold bronze and the back of ring can be stamped with up to 12 characters! Typically names are put here, but you can add anything you’d like that fits within the character limit. This gift option isn’t particularly a “sorority” item but I just thought it was a different, yet subtle option for a sorority gift. 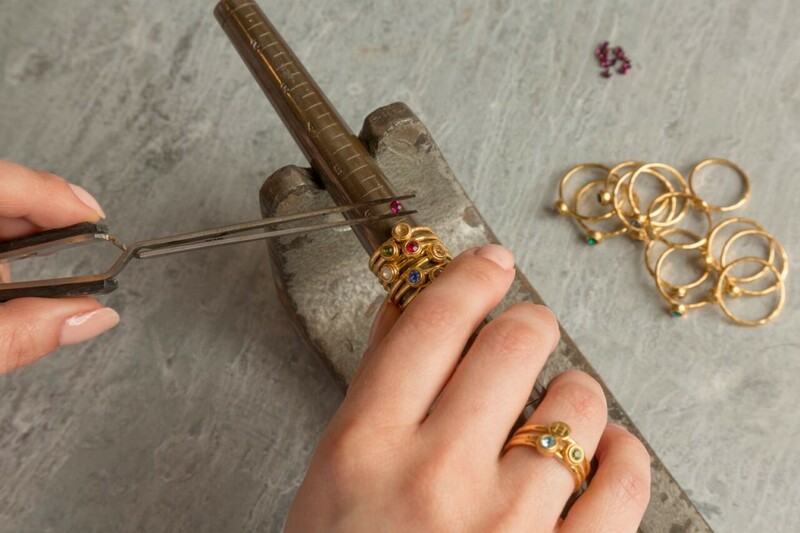 With these customizable stacked ring set, you can make a stack that represents a sorority without having the Greek letters blatantly stamped on. June and August birthstones (pink and green) would be perfect for Delta Zeta, or September and June birthstones (blue and pink) on a gold ring stack would be ideal for Delta Gamma. Add another ring with the recipient’s initial and now you have a personalized ring stack with an understated message of sorority pride. With a special gift from Nelle and Lizzy, you will give a wonderful woman the chance to show off her sorority pride for years to come. It will be a present that will let her always remember and cherish the moments she had in college, and even more so with her sorority.